O Grove is south of the Ría de Arousa, which joins with the Ría de Pontevedra. It is 21 km2 and has a population of 11,500, settled in various villages. It is made up by an island and a peninsula, the flat terrain being altered only by groups of granite rocks forming high points, the most prominent being the “con de A Sirabdella”, to the east, with an altitude of 166m. The isthmus (narrow strip of land) is a sandy spit 2 km long + ½ km wide in the centre, and was recently formed. In old maps, O’Grove appears to be an island. The average temperature in winter is 14 ºc and 24ºc in the summer, and a strong precipitation from April to September, however the rainiest months are November, December, January and March, in which we register most of the 1.000m.m annual precipitations in the municipality. Being surrounded by an exceptionally abundant sea, it is not surprising that it’s exploitation is the main economic activity. Small fishing boats work full-time catching fish, and shellfish, mostly whiting, horse mackerel, pollack, turbot, cuttlefish, spider crab, shrimps and lobsters. There is a plentiful and continuous supply of shellfish, especially clams, cockles and razor-fish which are collected at low-tide in the traditional way by an ‘army’ of women equipped with rakes and small hoes. Alongside the traditional harvesting of the shellfish, the cultivation of the mussels and oyster beds has had an enormous economic effect on the area.. The fishing and shellfish produce is sold in the market, located in the port of O Grove it is well worth a visit. 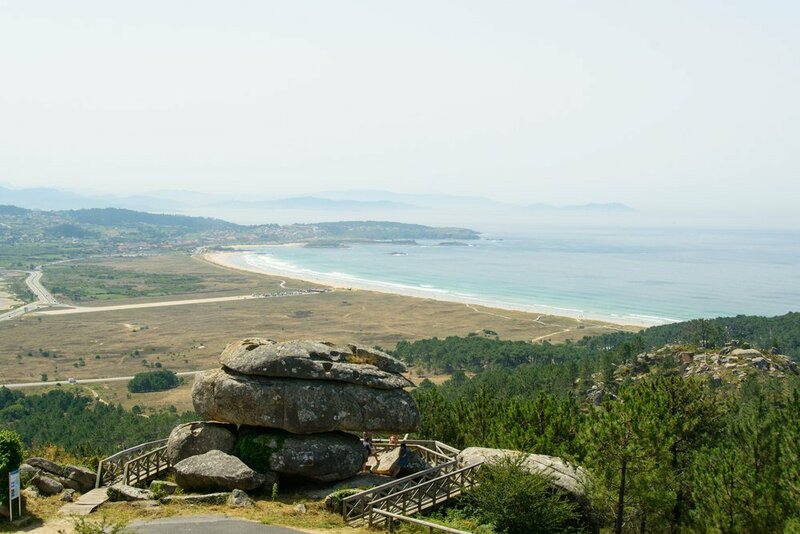 Around the coast you will find other important industries like construction, canned food industry and tourism, of which O Grove and Sanxenxo are the most important in Galicia. Celebration of the seafood in the middle of October (of Saturday previous to the later Sunday of the Virgin of Pilar) declared of National Tourist Interest, which has been celebrated since 1963. During nine days you can try all the seafood available from the rivers in the restaurants and other places in the port, at a low price and with many local performances. Our Lady of A Lanzada: last Sunday in August, full celebration of magic with its ritual bath of the nine waves for the fecundity. Fiesta da Malla started in 2008 in San Vicente do Grove, was born as a celebration to pay homage to the parish’s people who have always lived in the countryside and to show traditional arts and crafts (some already disappeared), focusing all the effort on the mesh or process through what the grain of straw is separated. Our Lady of the Heads, in the Monastery of Armenteira (20 Km.) Lunes de Pascua. Raia Party in Portonovo (13 Km.) Friday, Saturday and Palm Sunday. Muiñeira day, in Pontevedra (35 Km.) Last Saturday of May. Wine Party of Salnés , in Barrantes (21 Km.) First Saturday of June. Solla party, in Catoira (43 Km.) Eve of the 2nd Sunday of July. Clam party, in Carril (36 Km.) Sunday before July 16. San Benitiño, in Lérez (Pontevedra) (37 Km.). with National Tourist Interest. July 11. Callos party, in Mosteiro-Meis (23 Km.) Sunday closest to July 11. Albariño wine party, in Cambados (22 Km.) with Tourist Interest. first sunday in August. Viking party, in Catoira (43 Km.) with Tourist Interest. First sunday in August. Mussel party, in Vilanova de Arousa (28 Km.). First sunday in August. Peregrina Party, in Pontevedra (35 Km.) Mid-August. Tourist, in Sanxenxo (15 Km.) 25 August. Oyster party, in the hermitage of Our Lady of A Lanzada (9 Km.) Penultimate Sunday of August. Clam party, in Campelo-Poio (33Km.) third sunday in August. Maritime procession of Carmen, in Arousa Island (33 Km.) 1 of September. Santa Rosalía, in Sanxenxo (15 Km.) 3 to 5 of September. Our Lady of la Merced, in San Juan de Poio (32 Km.) 24 September. Procession of San Simón de Baión, in Vilanova de Arousa (28 Km.) from 28 to 30 October. La piedra (Vigo): Daily until 2:00 p.m.